Would you be part of a national acupuncture liaison group? 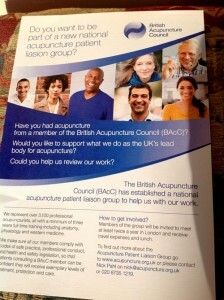 The British Acupuncture Council (BAcC) would like patients who have had treatment from a BAcC member (like me) to help review their work. They are working hard to enable acupuncture to become a more widely accepted treatment within the UK. To help the NHS understand it better and use it more. Ditto for GP’s to refer patients to acupuncturists more. The BAcC are lobbying parliament to get fairer regulation for acupuncturists in conjunction with other governing bodies of therapists. I am talking about osteopaths, chiropractors and the like here. At the moment we are not allowed to advertise what we do…in the sense that we cannot say we treat back pain, knee pain etc. etc. Which is bonkers, I know. So if you fancy a trip to London twice a year, travel paid and lunch, contact Nick Pahl on nick@acupuncture.org.uk or 0208 735 1219. Nick is the big cheese at the BAcC.